Home » Forex Trading Strategies » How to Trade the Gap? 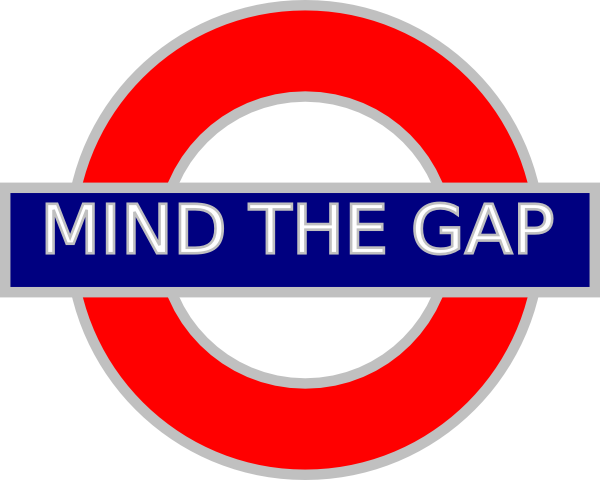 Gaps are areas found on charts in which there is a sharp upside or downside movement of a given financial instrument. It should be noted that between the two candles where you find the actual empty space there is no trading or little trading. The result is a gap in the usual price pattern on the chart. Gaps are due to underlying factors of technical or fundamental nature. They can be interpreted and exploited to make profits. Breakaway gaps: those gaps are found at the price pattern end, and they show a new trend is starting. Exhaustion gaps: those gaps are found by the price pattern end, and they signal the final endeavor to hit either new highs, or new lows (depending on the direction of the trend). Common gaps: those gaps cannot be found in price patterns, and they simply mark areas of empty space on the chart. Continuation gaps: you can see such gaps in the middle of a price pattern; they indicate that buyers or sellers are rushing to take advantage of the trend. Depending on the gap type, the latter are commonly filled. This means that the price has retreated to the level prior to the gap. One of the reasons for that to happen is technical, owing to the lack of support/resistance levels in the gap’s empty space. Another reason could be irrational exuberance, which means that the first rise may have been due to excessive optimism or pessimism and needs to be corrected. Price patterns are helpful in classifying gaps, and that is vital in determining whether the latter will be filled, or not. The most likely gaps for filling are exhaustion gaps, as they signal the price trend is to end. With continuation gaps and breakaway gaps, filling is much less likely, as they only confirm the current trend’s direction. Playing a gap can be done with different strategies. In some cases, purchasing or selling is undertaken when fundamental or technical factors are in favor of a gap on the next day of trading. As for currencies, an example can be given of taking a position on a forex pair in the course of its quick ascent on low liquidity and when overhead no major resistance is present. Sometimes gaps are filled in the day when they show up, which is known as fading. If one wants to take advantage of this counter gap movement, the underlying instrument should be traded in a direction opposite of the gap. As no one can be sure whether a gap will be faded, having a stop loss order below the perceived low or above the perceived high is an absolute must. After the gap filling for a forex pair or for other financial instrument starts, it can rarely be stopped, owing to the lack of immediate support or resistance in most cases. Gaps should be classified correctly, as exhaustion gaps signal one direction, whereas continuation gaps signal a different one. Volume is another key indicator. In breakaway gaps, traded volume in most cases is high. In most cases, however, low volume stands behind exhaustion gaps. The chart example below is based on a gap trading strategy for the forex market. The main principles behind it are several. First of all, the trade should be always done in the overall price direction. Second, a forex pair should have gapped massively above the key resistance or below the support level, on a 30-minute frame. Then, prices should have recovered to at least the 0.618 Fibo retracement of the gap size. Lastly, a candle should be present which stands for the price continuation in the gap direction, to ensure persistent intact support or resistance. The forex market is active 24 hours a day, five days a week. Currency pair’s visible gaps on a chart take place as the market reopens after the weekend. 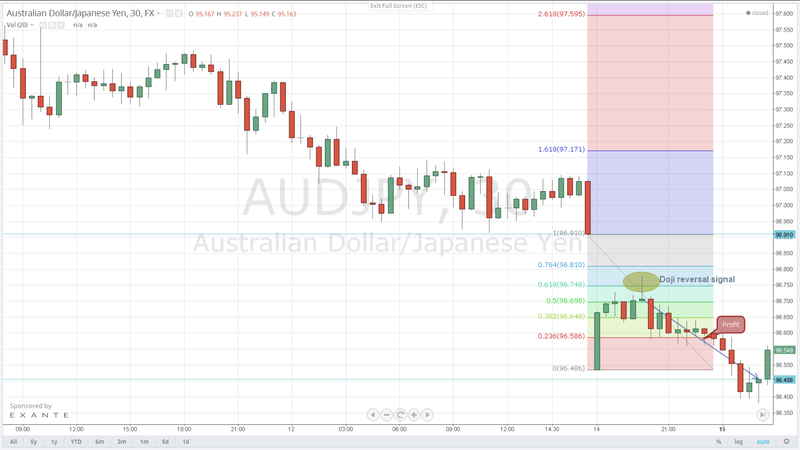 The 30-minute chart in our example shows the AUD/JPY gapping 45 pips down after the weekend, following a support level breakout on Friday. As you can see, the market started filling the gap, but the upside attempt was stopped at the 0.618 Fibo retracement; the doji formation that followed provided a reversal signal. That was a good opportunity to short the pair with a stop order just few pips above the doji, e.g. 96.81. What followed was a slide to just below 96.40, the point where the market showed some hesitation and the first two consecutive green candles showed that time was ripe for taking your profit.